To format HIV sequences for submission to GenBank and the other International Consortium Databases (EMBL & DDBJ), the HIV Sequence Database provides a quality-control and GenBank submission tool. The process is outlined below. 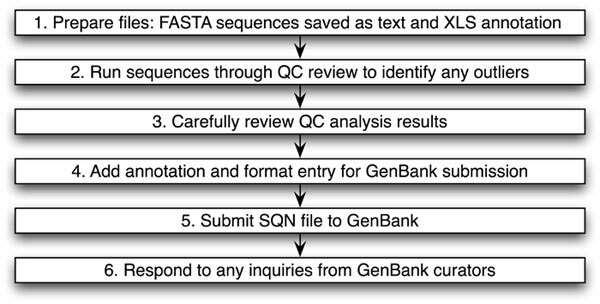 Note: You may choose to run the QC analysis (Steps 1-3) without preparing the sequences for submission to GenBank. No one will look at your sequences or QC results, unless you ask us for assistance. If you are not doing the GenBank submission process, ignore the instructions for making a spreadsheet of annotation data. Please prepare your data in two files, a sequence file and a comma delimited(.csv) file containing sequence annotation data (see example files). If you are doing only the QC analysis, not GenBank deposit, you need only the sequence file. The Fasta format uses a "greater-than" sign (>) to indicate the start of each sequence record. The sequence name should follow this symbol. Sequence names should not contain any space characters; please use an underscore character (_) to denote a space. If prepared via word-processing software, sequence data should be saved in plain-text format (ASCII encoding). Short sequences. For sequences <300 bp, some of the QC analyses will not work, but the tool can still be used to prepare the sequences and related data for GenBank entry. Sequences from multiple gene regions. 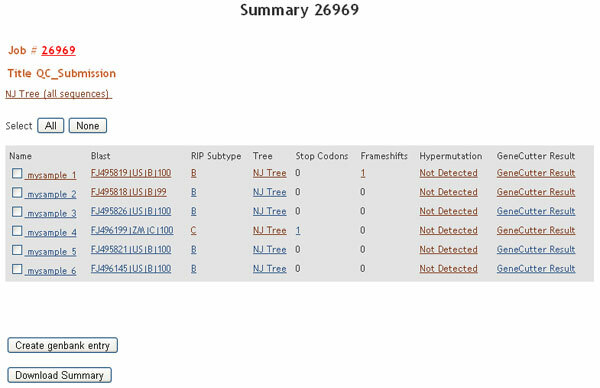 If your input file contains sequence fragments from different regions of the genome (for example, 20 gag sequences and 20 env sequences), the tree intended to compare all sequences together will not be informative. In such cases, you should either run the tool separately for each genomic region (1 analysis for the gag sequences and 1 analysis for the env sequences), or alternatively run the set together and perform additional analyses on your own. Non-HIV-1 sequences. As currently implemented, this tool is only useful for HIV-1 sequences. Speed. Because this tool compiles results from several other tools, it is slow. Please be patient; it may take several hours to produce results from large data sets. Consider breaking large sets into smaller batches. To export a file in Excel to comma delimited format, go to File > Save As, select CSV(Comma delimited)(*.csv). Each row in the comma delimited (.csv) file should correspond to a sequence in the Fasta file. The "header row" (top row) should name the data that appear in each column (e.g., "Sequence name", "subtype", "sampling date", etc.). One column, preferably the first column, should contain the name of the sequence exactly as it appears in the Fasta file. Any differences in sequence names will lead to serious errors. The order of rows for sequences in the two files need not match. Annotation data are associated with sequences by matching sequence names, rather than the order in the files. Each column should contain annotation data, such as the viral subtype, patient code, viral load, sample date, sample country, etc. Individual cells may be left blank if the data is unknown for a particular sequence. Details about supported annotation and the requisite format are given in Data Field Help. The CSV example shows what your CSV annotation file should look like. The QC tool accepts only HIV-1 sequences, but the GenBank Entry Generation tool can accept HIV-1, HIV-2, or SIV sequences. Prior to starting the preparation for GenBank deposit, you will be asked to select the organism of your sequences. All sequences for a single run must be the same organism. The tool does not support SHIV sequences at this time. If you want to use the tool for deposit of SHIV sequences, please contact us. It may be possible to devise a workaround on a case-by-case basis. Go to the form for sequence submission: QC tool. Enter your sequence set and email address. Click on the 'Submit' button to initiate the analysis. On submission, you will receive a confirmation email message. You will receive another message from seq-info@lanl.gov upon completion of the QC analysis. Note: Because this tool compiles results from several other tools, it is slow. Please be patient; it may take several hours to produce results from large data sets. Below is an example of a set of QC results. Each result is a link to more details. RIP. Look for any unexpected subtype. Interpret RIP results with caution; we recommend looking at each RIP link individually, as the summary report does not always reveal the whole story. Compare the RIP subtype with BLAST subtype. The RIP parameters used by the QC tool do not detect CRFs. If you want to detect CRFs, follow up with additional analyses; sometimes the QC BLAST results will give a clue that your sequence is a CRF. NJ tree of all sequences (single link near top of page). Look for sequences that are unexpectedly close or distant to each other. Look for sequences that are grouped with an unexpected subtype reference. Look for sequences that appear to be outliers or have an unusually long branchlength. NJ tree of single sequences. Look for grouping with unexpected subtype references. Stop codons and frameshifts. Multiple frameshifts or stops indicate poor sequence quality and/or unreliable alignment by Gene Cutter. Any gene containing a stop codon or frameshift will be annotated as a pseudogene in the gene annotations deposited to GenBank. Hypermutation. Closely examine any sequences where hypermutation is detected. You may want to remove them from further analyses or perform a further analysis to decide if they are truly hypermutants. Like any screening method, the QC cutoff for hypermutation can produce occasional false positives and false negatives. Because subtype B is used as the reference sequences, results for other subtypes may be less reliable. For more information, see Hypermut. Below is an example of QC Hypermut results. Gene Cutter. Check whether your sequences cover the expected region and coordinates. When you are confident that sequences appear as you expect, check the checkboxes for the sequences you want to submit to GenBank. Click on the 'Create GenBank entry' button to continue. The GenBank Entry Generation Tool will format sequences in ASN.1 (a.k.a. SQN or Sequin) format. GenBank's Sequin tool can also do this. The advantage of using the online service provided here is that feature annotation (which depicts gene locations along the sequence) will be added automatically from GeneCutter results. Click the "Begin GenBank Entry Generation" button to proceed. Step 4A: Contact Information. GenBank prefers to process updates to sequence data from the individual who submitted them. Please provide contact information for this individual, then proceed by clicking the "Next step" button. Step 4B: Manuscript Information. Provide publication information to accompany the sequences, if available. Click the "Next step" button to proceed. Step 4C: Annotation Data. Navigate to the CSV annotation file via the "Browse" button. If the file contains a header row, check the "Use first row as field names" box. Proceed by clicking the "Next step" button. Please review this carefully. This step maps columns of annotation to different regions of the GenBank entry, and great confusion will result if the fields are mapped inappropriately. The first several rows of data from the CSV file will be listed. Compare each column with the name at the head of the column to the data below. If you find that the column names do not match the data, change it by clicking where it says "change it here". Click the 'Submit' button when you are ready to add annotation to the sequences. After processing, you should receive an email message that contains 2 links, one to a zipped set of GenBank flatfiles ("gb.zip"), and one sequin-formatted file ("all.sequin"). The flatfiles are human readable plain text and can be read with a text editor or word processor. They approximate how the entries will appear after GenBank accession. The sequin file is formatted for submission to GenBank. GenBank does not accept sequence submissions in flatfile format. You can open the sequin files with GenBank's Sequin software or with a text editor, should you choose. Please unzip and review at least one of the flatfiles. Please do not edit the flatfiles if you encounter errors, because the changes will not be reflected in the sequin files. You must correct mistakes that appear flatfiles by repeating the process from Step 4. In case of insurmountable difficulty, please contact seq-info@lanl.gov with a detailed description of the problem. Download the sequin (sqn) file and save it on your computer's drive, noting where you save it. Then, with a web browser, open this page: Sequin MacroSend. At the bottom, locate the form entry called "File(s)". Press the "Browse" button, and locate the sequin file you created and saved above. Note: While GenBank does also accept email submissions of sequin files, some mail software can corrupt the file contents by modifying the file encoding, and thereby cause errors that are difficult to diagnose. The web submission form does not suffer this problem. Specify your contact information (First/last name, email, other optional fields). Note: Correspondence regarding these sequences and subsequent updates or corrections should be sent from the individual whose contact information is provided here. In the subject line, you should specify how many of what kind of sequences are in the sqn file (e.g., '186 HIV-1 env sequences'). In the comments field, you can enter a message that functions as a cover letter for the GenBank curatorial staff. You should specify whether to embargo the data, pending manuscript acceptance, or disclose them immediately upon review and acceptance. You might also mention whether or not the sequences should be available as a PopSet. Upon completion, click on the 'Submit' button, and look for a confirmation that the file has been received. You will receive an automated acknowledgement from GenBank via email. You may also receive clarifying questions from a GenBank curator. You will receive a message containing accession numbers upon acceptance.